Corsair has announced its first SFX form factor PSUs - the SF600 and SF450. Rated at 600W and 450W respectively, the PSUs are fully modular, 80 Plus Gold certified and use 105°C rated Japanese capacitors. Both PSUs use 90mm cooling fans - this is 10mm larger than those found in most other SFX PSUs so could help to allow lower noise levels than the usual 80mm fans. Corsair has included a zero RPM mode too, as it does in its premium full size PSUs such as the RMi series, which switches the fan off at low and medium loads to reduce noise levels. Corsair has joined the likes of SilverStone and BeQuiet in offering SFX PSUs and like SilverStone and more recently Fractal Design, offers cases that use the small PSUs too (SilverStone has done this for a while, with Fractal including an SFX PSU with its recent Node 202 small form factor case and Corsair with its Bulldog case. You can read our recent interview with Corsair where we discuss its SFX PSUs and small form factor cases here. 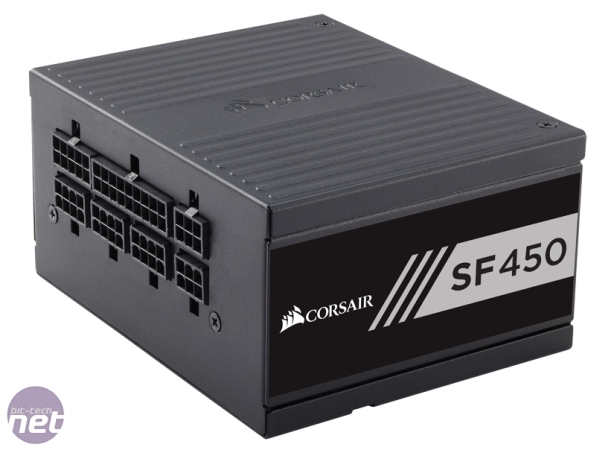 The SF450 is available immediately worldwide from Corsair’s worldwide network of authorized retailers and distributors. The SF600 will be available shortly and is available immediately for pre-order.